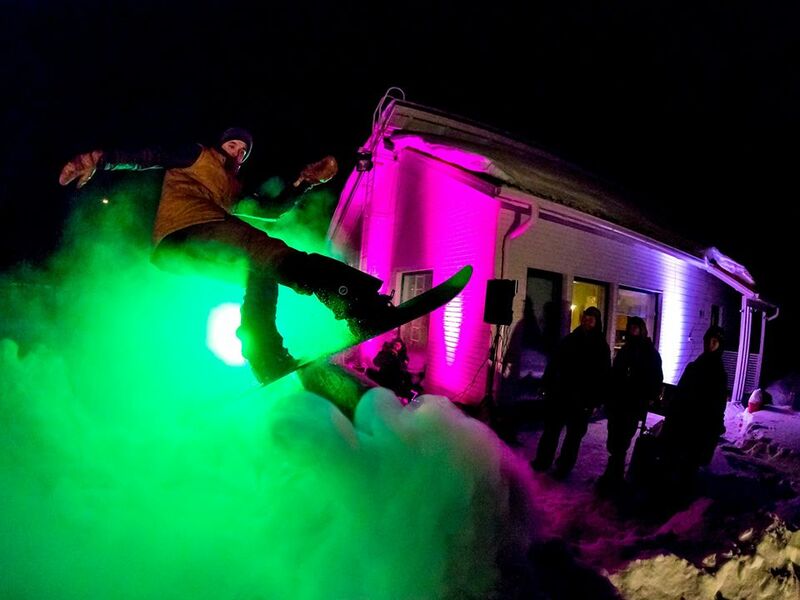 Arctic Weekend is a Festival for skiers, snowboarders and like-minded people, held every year in Rovaniemi, Finland on the last weekend of October. The idea is to kick off the winter season with interesting presentations, movie premieres, discussions, charity auctions, live music, good food, even better parties and winter vibes. There is a chance to play and try riding on real snow, an open ski & snowboard session as well as an invitational contest session later in the evening. 2018 will be the 2nd annual Arctic Weekend. The first one, in 2017 was a big success. Tickets to the main event in Korundi were sold out in advance, and all of the other locations were at full capacity too. The event had a special vibe, and people did enjoy the program very much. Actually 100% of the over 40 people who answered our post-event questionnaire, gave a 9 or 10/10 answer on how likely they were to recommend Arctic Weekend to their friends. This year, we are expecting a small growth in the amount of people attending, but quite a big growth in the quality of the program. Most of the program is in Finnish, since majority of the audience will be Finnish speaking. There is however plenty of stuff to enjoy even if you are not a native Finn. The event is very welcoming for all those who share an interest in winter and snow – not only active riders. If you are interested, we recommend you grab those tickets in advance, because they are selling out fast. Info below. The interest from abroad and numerous messages in english has been a pleasant surprise for us organisers. Next year, in 2019, we are looking forward to adding more program in english as well. But there is no need to wait, since there is much you can enjoy anyways. We compiled this page to act as a guide for international attendees in 2018. See you at the Arctic Weekend! The idea is to kick off the winter season with interesting presentations, movie premieres, discussions, charity auctions, live music, good food, even better parties and winter vibes. There is also a chance for kids to play and try riding on real snow, and open ski & snowboard session as well as an invitational contest session later in the evening. For skiers, snowboarders and like-minded people. The event is very welcoming for all those who share an interest in winter and gliding downhill on snow – regardless of equipment choice, skill level, type of riding etc. Arctic Weekend takes place in Rovaniemi, the capital of Lapland, the north of Finland, right on the Arctic Circle. The combination of cool venues, good vibes, interesting high quality program and creative elements of surprise make Arctic Weekend what it is. The event was born out of need and will to do something cool to benefit the ski & snowboard scene and culture in Finland – especially in the North – and this is still the driving force behind the event. From riders to riders. NOTE: KICK OFF & PARTY TICKETS ARE STILL AVAILABLE // DAY TICKETS AND THE ARCTIC WEEKEND TICKETS (DAY + PARTY) ARE SOLD OUT. Friday: You will need a separate ticket for the Kick Off in Kauppayhtiö (sold in Kauppayhtiö, 10 €, Cash Only). Saturday: For the Main Day in Korundi you have three options. Tickets are sold over the desk at Korundi, and online on lippu.fi. Lippu.fi will add a fee to the price. Clicking on the links will take you to Lippu.fi to buy tickets. SOLD OUT – The Arctic Weekend Ticket (11AM–3:30AM / 30 € / K-18). Where should I stay in Rovaniemi? We recommend booking a room or a cabin through our partners: Hostel Cafe Koti, Lapland Hotels Ounasvaara Chalets and Lapland Hotels Sky Ounasvaara all have special offers. 10% discount for bookings made via e-mail info@hostelcafekoti.fi. Mention code ”Arctic Weekend” when making the booking. Book through www.laplandhotels.com using code ALLARW18. Where should I eat in Rovaniemi? NOTE: All of the programs are at Korundi. The Afterparty too! Many of the movies are actual Premieres – presented by the riders themselves! What is life and work in the mountains like? How does it affect your every day family life? What kind of sacrifices do you need to make? What do you get in return? Can you escape work in your free time? Lots of interesting stories, spoken in english! two riders get to take part in the Rail Rave! Invitational show session / contest where we turn the setup into a rave club. Two riders get picked from the Open Sesh to attend. SLK has such a wide selection of moods that it sounds like you’re at a house party, but don’t be fooled, it’s definitely in a good way! A raging party is guaranteed. Of course you need a good old brunch to close down the weekend. And brunches don’t get much better than this.